Established on one and a half acres is our first planting of the classic Shiraz vines that the Pyrenees wine region is renowned for. Our peaceful vineyard is in balance with the bushland that surrounds us, and we manage the site with minimal impact on the environment and the native wildlife. 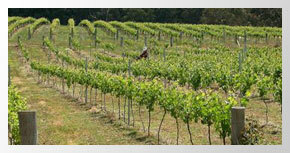 The grapes are hand-picked and our wine is produced in the traditional French style with minimal additives. Our wine has classic Pyrenees Shiraz characteristics including a deep intense flavour, naturally soft tannin and a classic rich Shiraz structure. "The wine itself is plush and deeply fruited. It’s pure Moonambel shiraz. Plums, ground spice, mint, a suggestion of black pepper. It feels well balanced throughout and finishes with a burst of succulent fruit and spice. There’s almost a Xmas cake quality to this. Beautifully made and fruited." While staying at Tandamuki, you are welcome to stroll through the vineyard and encouraged to sample a glass of our premium wine on the deck of your cottage on a warm evening or by the log fire in winter. 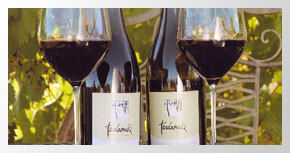 You can also purchase our wines by the bottle or by the case.